GRILL DIRECTIONS: Place ribs in large saucepan or Dutch oven; add enough water to cover. Bring to a boil. Reduce heat; cover and simmer 45 to 60 minutes or until pork is tender and no longer pink next to bones. Drain thoroughly. Heat grill. In small bowl, combine barbecue, plum and hoisin sauces; blend well. When ready to grill, brush ribs with sauce mixture. Place ribs on gas grill over medium heat or on charcoal grill 4 to 6 inches from medium coals; cover grill. Cook 10 to 15 minutes or until pork is browned, turning and brushing occasionally with sauce mixture. Discard any remaining sauce mixture. To broil ribs, place on broiler pan; broil 4 to 6 inches from heat using times above as a guide, turning and brushing occasionally with sauce mixture. Sweet and spicy hoisin sauce is popular in Chinese cooking, both as a condiment and a flavoring for recipes. The thick, red-brown sauce is made with soybeans, garlic, chiles and spices. After opening a jar, hoisin sauce keeps indefinitely in the refrigerator. Look for hoisin sauce in the Asian food section of the grocery store. Simmer these ribs up to 12 hours in advance; cover and refrigerate them until grilling time. 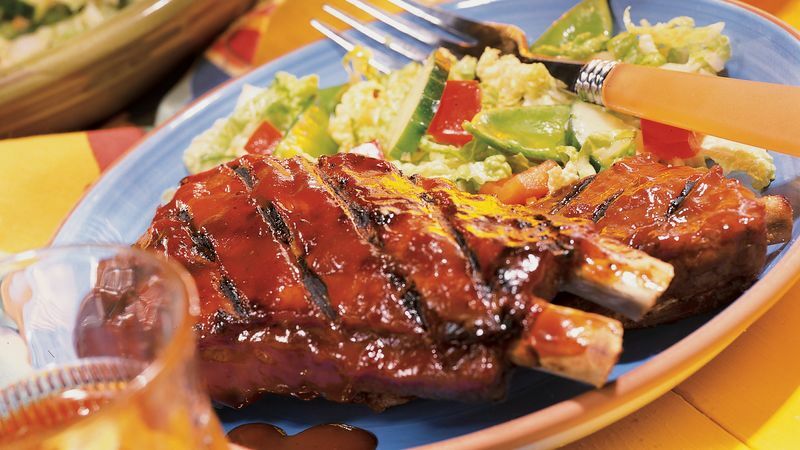 Sticky fingers are a result of enjoying ribs. Dampen small towels, roll up and place near each dinner plate. A small bowl of water at each place setting also keeps hands clean.